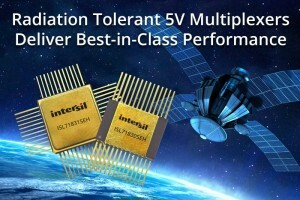 Intersil Corp. recently expanded its suite of radiation-tolerant multiplexers with two new, single-supply, 5-V devices—the 16-channel ISL71830SEH and 32-channel ISL71831SEH. The new multiplexers provide data acquisition systems quality ESD protection and signal processing performance. In addition, the 5-V multiplexers also offer faster propagation delays, which improve signal processing response time. The enhanced 5-kV ESD protection feature makes it unnecessary to use costly external protection diodes on the input pins. In addition, both multiplexers have reduced RON of 120 Ω and propagation delays of less than 100 ns to increase the overall performance and accuracy of telemetry signals processed and multiplexed into an analog-to-digital converter’s (ADC) input. 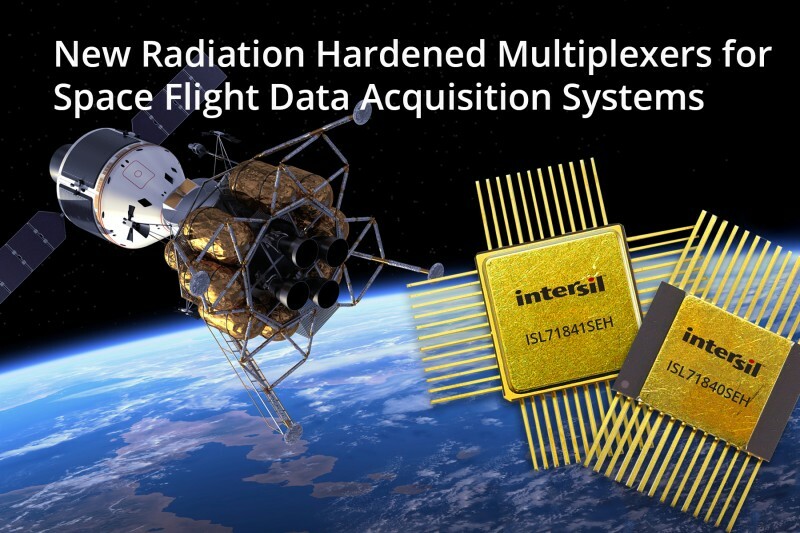 Intersil Corp. recently launched the ISL71840SEH and ISL71841SEH, new radiation hardened (rad hard) multiplexers that offer ESD protection and high signal chain accuracy and timing performance. 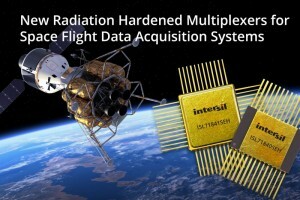 The ISL71840SEH 30V 16-channel multiplexer is a drop-in replacement for Intersil’s HS9-1840ARH, which has been aboard nearly every satellite and space exploration mission (e.g., NASA’s Orion flight test). For applications with form factor constraints, the ISL71841SEH offers high performance and 41% reduced board space compared with an ISL71840SEH two-chip solution. Both the ISL71840SEH and ISL71841SEH offer per-switch over-voltage protection. When an input channel experiences over-voltage, the remaining channels continue sending data to the ADC. Both multiplexers provide a “cold spare” redundant capability, which enables the connection of two or three additional unpowered multiplexers to a common data bus. If needed, a redundant multiplexer is immediately activated. Both multiplexers provide a wide supply range with split-rail operation from ±10.8 V to 16.5 V and an absolute maximum of ±20 V.
Microcontrollers need to be protected from of electrostatic discharge (ESD). You can use the circuit described in this post when you have an application requires a greater degree of ESD protection than what you get from an IC on its I/O pins. Although there are many ESD clamping devices out there, they don’t typically enable you to precisely limit voltage overshoots and undershoots. Normally, when dealing with a microcontroller or other digital circuit the connections on the device are protected against electrostatic dis­charge. Nevertheless engineers are 4ever taking special precautions when handling such devices to avoid the risks of ESD: the lab will have an anti-static covering on the floor, and nylon clothes and shoes with soles made of insulating material are avoided. And, in case that is not enough, it is normal to wear an anti-static wrist band when moving devices from their anti-static bags to the anti-static bench surface. But what exactly do we mean when we talk about ESD? 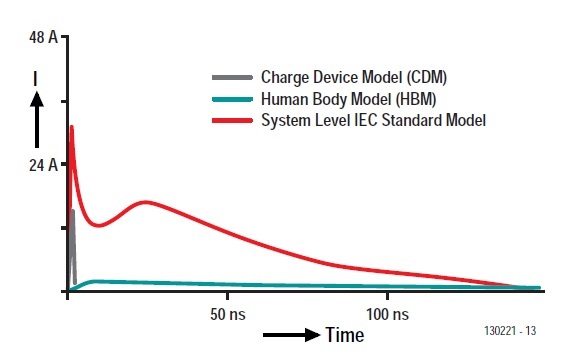 The first model for static discharge, mentioned as early as the 19thcentury, was the “human body model” (HBM). This takes as its starting point a voltage of up to 40 kV, a body capaci­tance of a few hundred picofarads, and a (skin) resistance of 1.5 kΩ. We find that even with a static voltage of only 10 kV, as might easily be acquired by walking across an artificial fiber car­pet in shoes with synthetic soles, it is possible to discharge through a fingertip at peak cur­rents of up to 20 A! The discharge also hap­pens in a very short period, perhaps measured in nanoseconds. The HBM was adopted in the electronics industry in the 1970s with the introduction of sensitive JFET devices in space applications. The compo­nents were tested using a simple RC circuit like the one shown in Figure 1. The discharge cur­rent depends only on the resistance in the cir­cuit, and the damped discharge curve is largely free of oscillation and is accurately reproducible. Figure 2 shows the typical protection circuitry provided on a microcontroller’s I/O port. This example is from an Atmel ATmega. 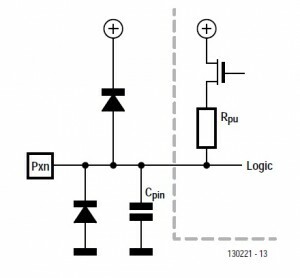 Other microcontrol­lers and logic devices use similar arrangements. Two bipolar protection diodes conduct discharge currents that could cause undershoots or overshoots to one of the supply rails, either VCC or ground. However, the diodes take about 6 ns before they conduct fully. Since ESD transients can sometimes be considerably shorter than this, it is possible that the CMOS circuit structures will be damaged long before the diodes spring into action. The parasitic capacitance of the pin is around 6 pF, and this is quickly charged up by the energy in the electrostatic discharge. Unfortunately, we cannot increase this capacitance with­out increasing the impedance of the pin, which is not desirable. 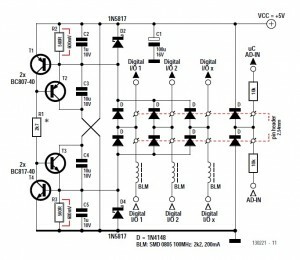 Standard ESD protection circuits like this one are designed to meet the particular requirements set by the ESD Association. However, it is becoming apparent that the traditional models are not appropriate for modern applications. Recent efforts have been directed toward developing a new “system level model” (SLM), which takes into account the different aspects of the older models. This model employs two stored charges that are discharged in different ways, creating a high-amplitude current pulse that decays very quickly plus a low-amplitude pulse that dies away more slowly. The energy transferred in a dis­charge under the SLM can be very much higher than that in the traditional models (Figure 3). It is readily apparent that the conventional I/O pin circuitry on the IC is not sufficient to provide ESD protection under this model. 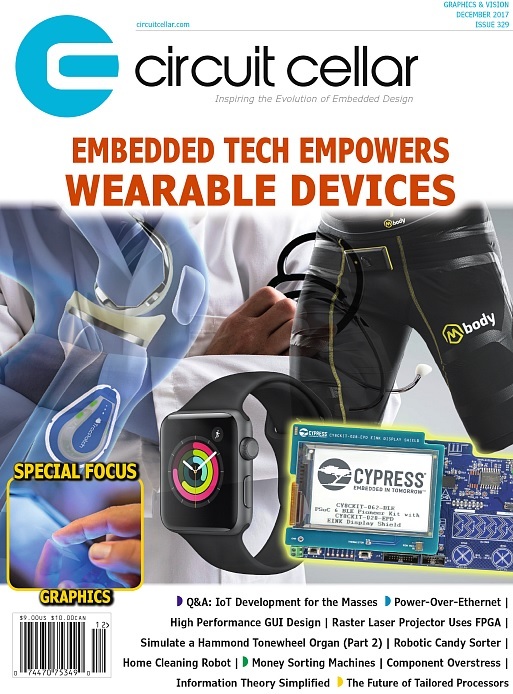 Also, the con­tinuing industry pressure to make smaller and more complex structures makes it very difficult for design engineers even to maintain current levels of ESD protection, let alone improve on them. In other words: the silicon area needed to provide ESD protection in accordance with the SLM is simply not available! For this reason, external ESD clamp circuits are becoming more rele­vant. If a component provides only a low level of ESD protection (or even none at all) it is possible to add such a circuit at the points most at risk. The clamp circuits usually use so-called transient suppression diodes (transils or tranzorbs) which, like Zener diodes, start to conduct at a specified threshold voltage. However, unlike Zener diodes, they react quickly and can withstand much higher current transients. There are many variations on the circuit design, but none has exceptional performance and none offers precise clamping of voltage undershoots and overshoots. If we are in the lucky position of not having to worry about the last cent of materials cost or the last square millimeter of board area, we can easily cre­ate a state-of-the-art active ESD protection circuit from discrete components (Figure 4). The transistor circuit forms a kind of regulated voltage divider. The current through the two resistors R2 and R3 is such that the voltages across them are just enough that transistors T1 and T4 start to conduct and T2 and T3 are just short of saturation. So we have one base-emitter voltage (about 600 mV) across each of these two resistors, which means in turn that the emitters of T2 and T3 are 600 mV below VCC and above ground respectively. The circuit as shown is suitable for a 5 V supply; R1 can be changed to suit supplies of 3.3 V or 2.7 V if needed. What is the point of this complexity? 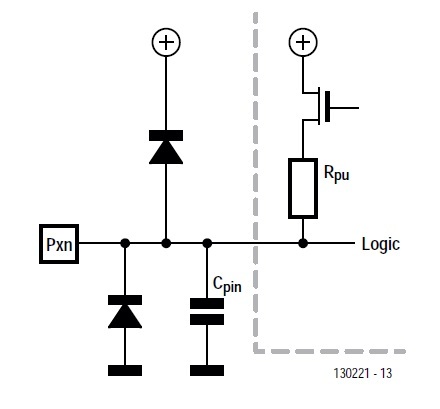 If the I/O pin is high (at +5 V) the upper 1N4148 switching diode will conduct fully as its cathode is at only 4.4 V. If a positive voltage transient should occur it will be conducted by the 1N4148, without switching delay, to the positive rail by 1N5817 Schottky diode D2, which acts quickly and has a low forward voltage. The same thing happens with polarities reversed when a negative voltage transient (below ground) occurs. Hence the digital inputs and outputs are protected against voltage excursions outside the range of the supply rails. 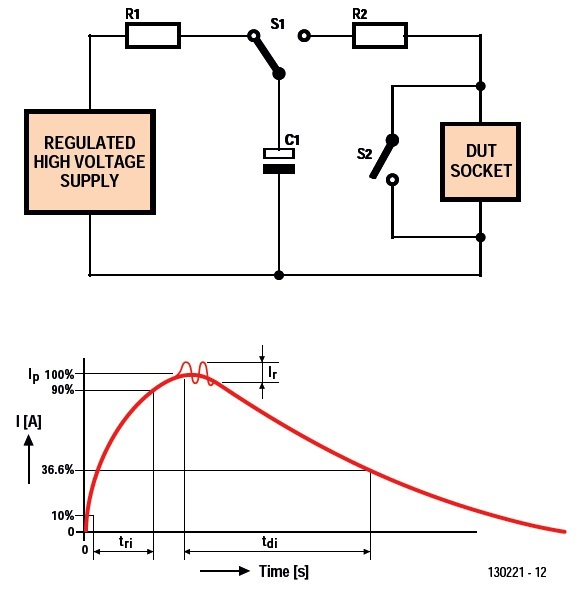 In addition, voltage peaks are limited by the use of suppression inductors. The Murata BLM series inductor presents a relatively high impedance to signals in the 100 MHz range and so can significantly reduce the level of transients. 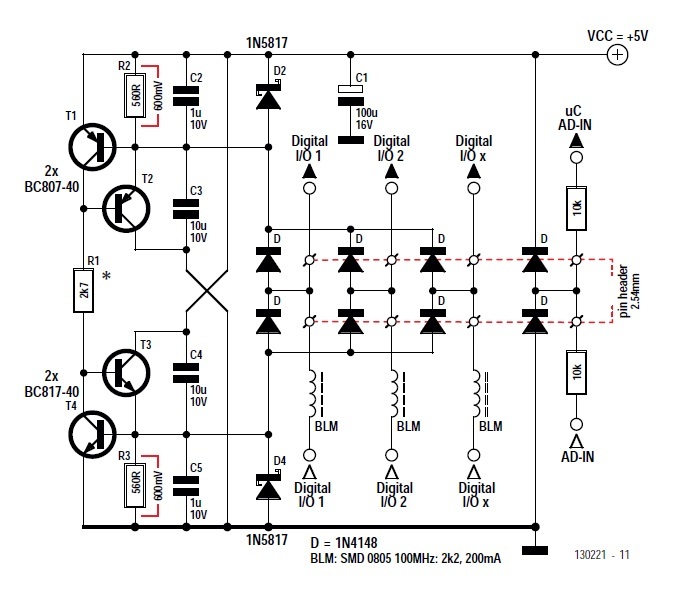 Although the approach we have described works well with digital levels, it is not suitable for use with signals destined for the analog-to-digital converter (ADC) on a microcontroller. In this case a reverse-biased diode between the signal and each supply rail is required to clamp overshoots and undershoots, with a pair of 10 kΩ series resistors to limit the transient current. Editor’s note: This article originally appeared in Elektor January/February 2014. 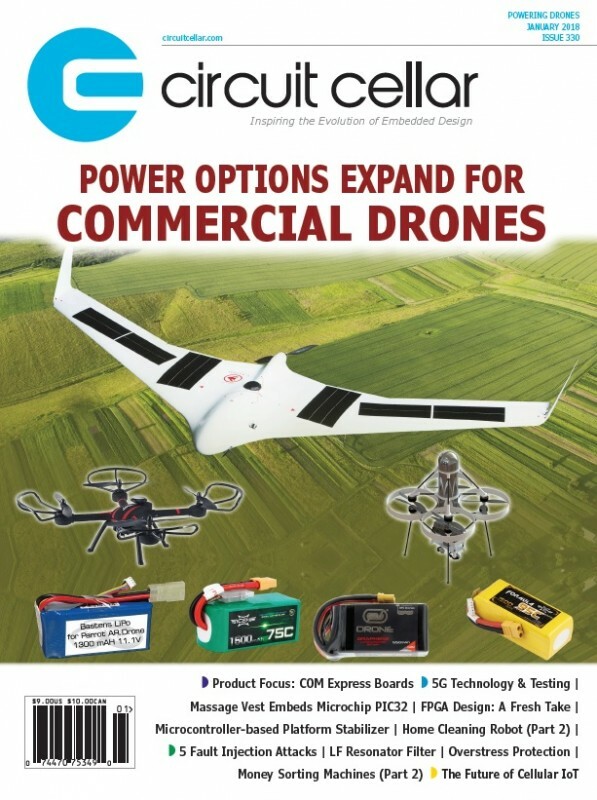 It was shortened and updated for publication on CircuitCellar.com, which is an Elektor International Media Publication.